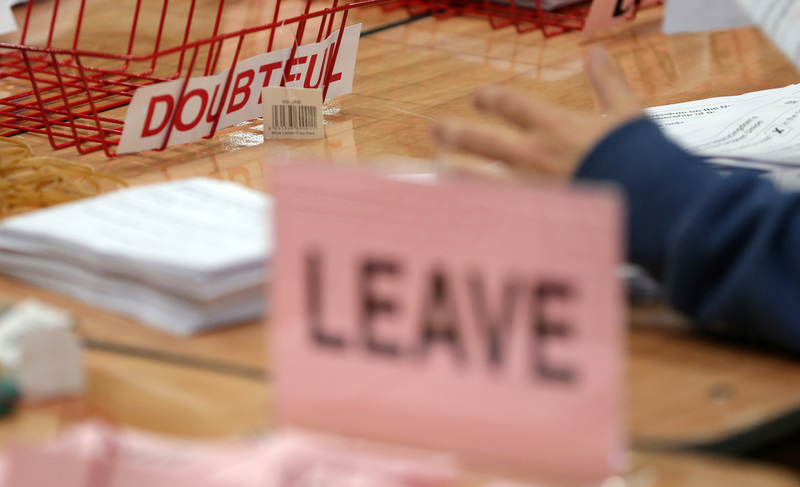 THE UK referendum result backing a withdrawal from the European Union has highlighted clear constitutional fault lines in Britain and Ireland. England voted strongly to leave the EU, Wales followed, but Scotland and Northern Ireland voted to remain. And within Northern Ireland - a place already riven with political and sectarian tensions - voters are divided still further. 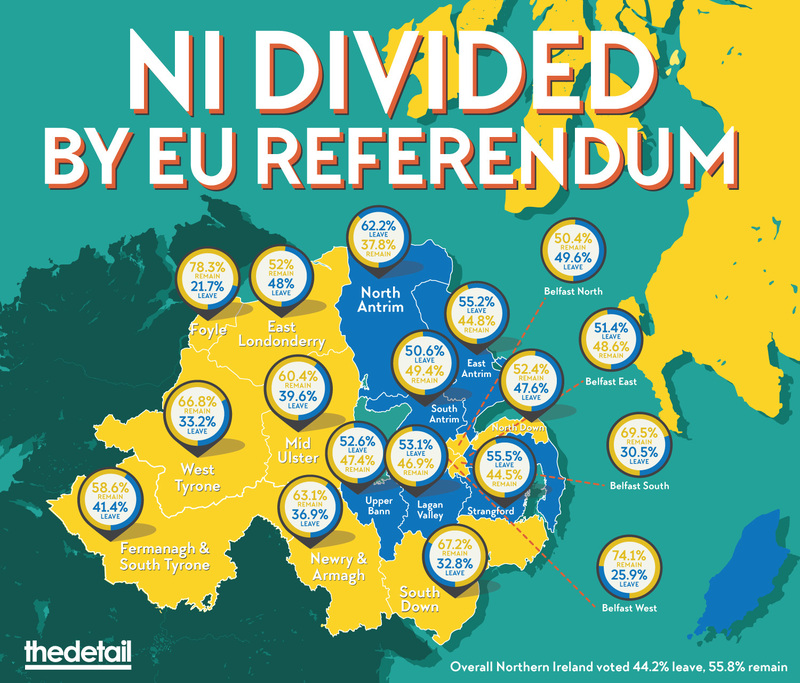 Areas that are predominantly Irish nationalist have largely voted to remain in the EU, while predominantly unionist areas of Northern Ireland voted to leave. The peace process was built on a framework of cross-border relationships that were successfully blurring the divisions across Ireland north and south, and between Ireland and Britain. Now the referendum result exposes opposing philosophies on these islands, introducing a huge element of uncertainty. No one - not even the victorious 'Leave' campaign - knows where we go from here. An infographic project published in April 2015 by The Detail flagged-up the political uncertainties that are now emerging. Today, the hard won political settlement in Northern Ireland faces serious questions. At a time when a route to long-term stability was taking shape at Stormont, with the formation of the first government run solely by the DUP and Sinn Féin, the path ahead has been shaken by England's political earthquake. There has been huge complacency about the implications of a ‘Brexit’ - a British exit from the EU - for the future of politics in Northern Ireland as was reported here. And much of that has been based on faulty assumptions over the mood among nationalists. Lower voter turnout among nationalists in May’s Stormont Assembly elections saw an effective drop in support for Sinn Féin and the SDLP. It fuelled theories that nationalists had lost interest in their politicians and in Irish unity. But that ignored a more plausible explanation. After Northern Ireland was founded in 1921, with the border positioned so as to create an in-built unionist majority, many nationalists existed at a degree of separation from the fledgling state. They nurtured their own separate school system, which was Catholic, but which was also set apart by its Irish identity. Many nationalists also embraced the extensive all-Ireland cultural network of the Gaelic Athletic Association (GAA). Despite the substantial social advances they made over the generations, nationalists broadly continued to experience a kind of semi-detached status until 1998 when the Good Friday Agreement gave them a new stake in Northern Ireland politics, including a guaranteed place in government. But despite their early optimism, nationalists have often seen Stormont emerge as a barrier to securing their rights. Many Catholic/nationalist communities still experience higher levels of deprivation, yet the lowest levels of economic investment and the poorest standard of road and rail infrastructure are in predominantly nationalist areas. More broadly, nationalists have not seen the promised ‘parity of esteem' for the Irish identity - it is barely visible in the fabric of the Stormont parliament, or in the shared public space of many town or city centres, while policies such as an Irish language act have been blocked despite similar legislation existing elsewhere in the UK. Beyond politics, sections of the media in Belfast don’t fully report on southern news, politics, culture or sport across the Irish border. Twenty years into the peace process, nationalists say that the places within modern Northern Ireland where their Irish identity is most obviously reflected remain inside their own community, including in their schools and in the GAA. Lower voter turnout could be a sign that nationalists are comfortable with the status quo, but it’s just as likely that many have withdrawn from a disappointing political process and are waiting for a better offer to come along. How will they respond to the outworking of Brexit? Unionists have been caricatured as having a siege mentality - as constantly feeling the need to defend their position and their Britishness. Put more sympathetically, unionism could be seen as being frustrated that the political sands seem to be constantly shifting beneath their feet: The beginning of the Troubles heralded the fall of Stormont; the 1985 Anglo-Irish Agreement saw London and Dublin go behind unionist backs to broker a deal on closer cooperation; the IRA ceasefire and the 1998 Good Friday Agreement saw republicans enter government and also delivered the loss of unionist touchstones such as the RUC. And after all that, unionists see that nationalists continue to withhold allegiance to the Northern Ireland state. The DUP supported calls to leave the EU, but while a majority of people in Northern Ireland voted to remain, the party seems to have caught the mood among many of its own supporters despite the financial risks of Brexit to industries such as farming. The politics of the peace process has been as difficult for unionists as it has been for nationalists. Those unionists who voted for the UK to leave the EU may have felt that it pulls Northern Ireland closer to London and further away from Dublin. But unionism's big political challenge is to build a future with Irish nationalism, not the newly emerging English nationalism. That task has now been made more difficult. 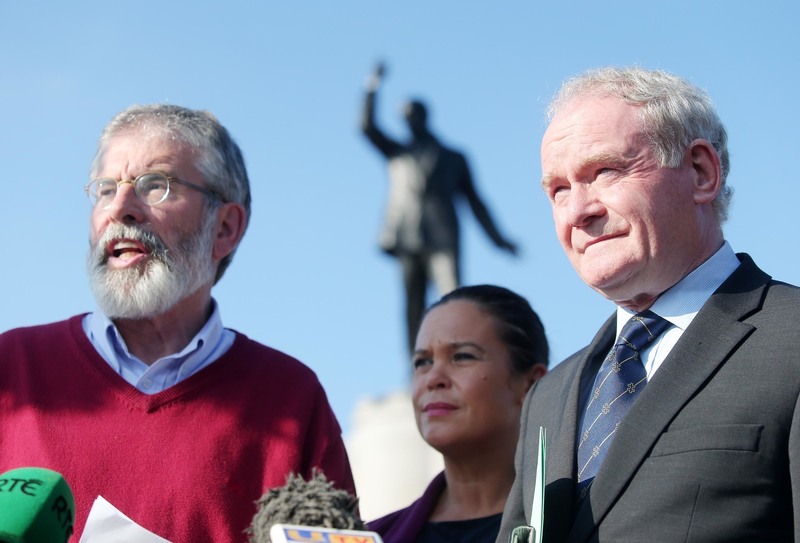 Three weeks ago, in a move that must have been timed with Brexit in mind, Sinn Féin floated new language on its vision for Irish unity. 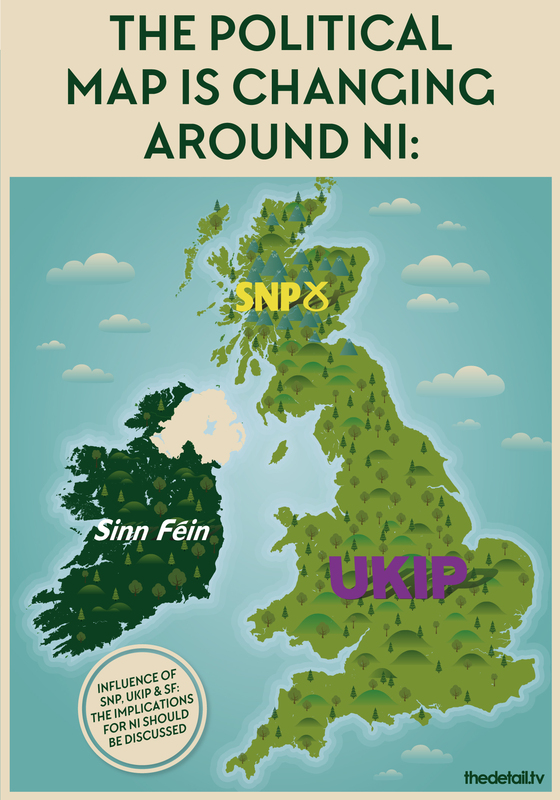 As was first revealed in The Detail here, the party envisaged the continued existence of Stormont – and effectively the Northern Ireland state – within a united Ireland. It came against the background of the political changes under way across these islands - including Sinn Féin’s growth in the Irish republic – plus the demographic shifts inside Northern Ireland that have seen the decline of the once unassailable unionist majority. The Detail previously explored how these factors might see proposals such as joint British-Irish sovereignty in Northern Ireland emerge as a new long-term compromise. But where does Brexit leave Sinn Féin's plans and how will unionists respond if nationalists push for concessions as Britain leaves the EU? Before the referendum, Northern Ireland could see a path that led to a more stable future, but now there is uncertainty on the way forward. Sinn Féin's immediate calls for a border poll seem knee-jerk, unless republicans can present an option that appears deliverable. Scottish demands for another referendum on independence sound more plausible. But both face the challenge of economic realities, plus the risk that voters may fear further instability. Today doesn’t represent political Armageddon, but it dramatically accentuates difference and division in the UK, in Ireland and across Europe. The best that Brexit supporters seem to be able to offer in the short-term is a fractured United Kingdom, held together only by the absence of an obvious alternative. That will be a cold house for everyone.